I doubt this one needs a lot of explanation. 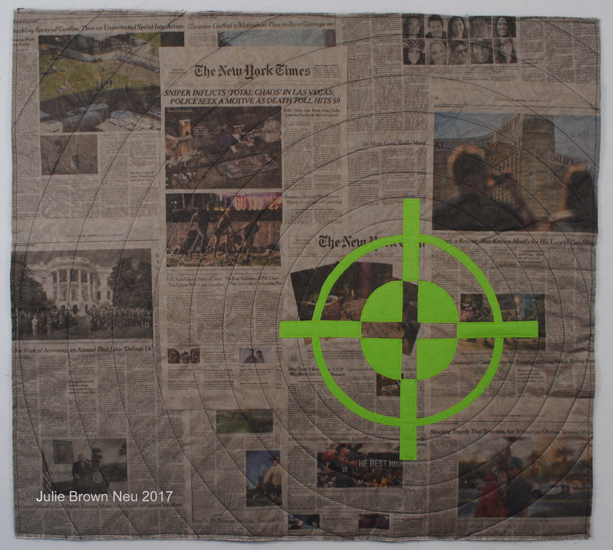 It includes pages from The New York Times on October 3rd and 4th, 2017, overlaid with a gray sheer and quilted with black thread in concentric circles. The green gun sight image is appliqued on top. I used actual newspapers, knowing that this piece will wear over time. I expect the pages to yellow and tear to show the passage of time. I hope that the time that passes will bring change in the use of guns in the U.S., but I fear that time will pass with little change at all. I am from a gun-owning family. I have looked through the sights of a loaded gun and pulled the trigger. Yet, I cannot dismiss the devastation and terror guns have wrought on our watch. In this country, guns are no longer being used just for hunting animals. Instead, we have become the hunted.